One year ago, the IRS announced the 2018 increase in 401(k) contribution limit to $18,500. Any idea if we can expect the IRS to announce the 2019 limits today? GetMe...The announcement is coming soon, but you can reasonably bank on this. The CPI calculation pushed the limits upward. A week later still no update from IRS. In 2017, announcement was on Oct 20. Any idea when this will be announced? It should be this month, so hopefully next week. This guy claims to use the same methods as the IRS and that he has been 100% accurate in prior predictions. But who knows? He says that 401k/403b/457 limits will increase to $19k of elective deferrals and $56k for total contributions. 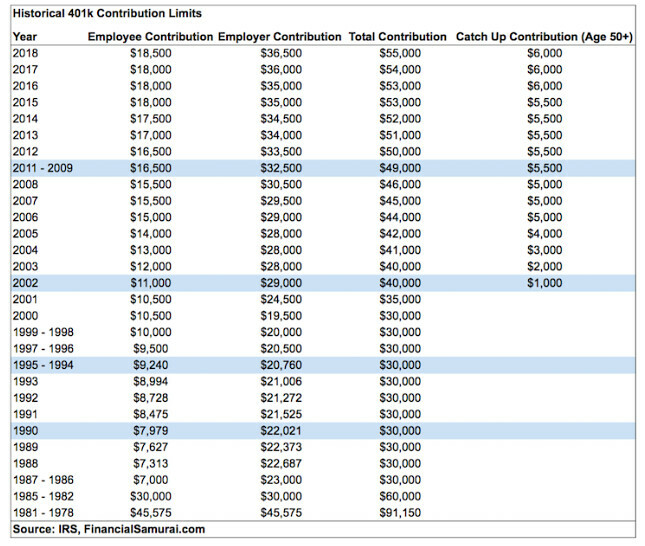 IRA contribution limits should increase to $6k. I suspect that he's correct. I hope that they increase HSA limits to $7k for family plans too. the HSA limit for both individuals and families is comically low given how much of a struggle it is in the event of an actual illness. both should be at least double. "here save $3450 tax free this year. but remember that hospital visit? yeah. your total will be $257,000 from the facility, $75,000 from the surgeon, $50,000 for the anesthetist who is out of network and plans to balance bill you.. but don't forget $35,000 from the pharmacy. ok then, due on receipt." Well, the family limit is enough for us to cover one family member's annual out of pocket maximum and almost enough for the whole family. Maybe they are gun shy and double checking their math after screwing up the HSA max last time. Only on Bogleheads would you find a question about next year's 401k limit in October. Been wondering it all week. My job is insecure, so I plan to maximize my 401k by July. It's a complicated calculation. "That guy is forum member @tfb and he knows exactly what he is talking about and several others have also provided the same information. No hoping required. The IRS released Rev. Proc. 2018-30 on May 10th 2019. The maximum family contribution limits will be $7K. On May 4th 2017 in accordance with the law, the IRS released the 2018 HSA family limit of $6900 based on the CPI. The Tax Cuts and Jobs Act in Dec 2017 changed the law to use the Chained-CPI. Om March 2nd 2018 in accordance with the new law, the IRS revised the 2018 HSA family limit to $6850 based on the Chained-CPI. After petition by numerous parties the IRS determined that relief was in the best interest of sound and efficient tax administration. In April the IRS granted relief for the retroactive decrease to $6,850 an reinstated the original $6,900 limit. There are plenty of opportunities to be unhappy with the IRS. Let's not bash them for faithfully executing the law. The IRS released the limits for 2019. - 401(k) elective deferral amount increased from $18,500 to $19,000. - Catch-up contributions unchanged at $6,000. - IRA contributions increased from $5,500 to $6,000. See the link for other limits. Your example is an absurd view of how the HSA is supposed to work. The HSA is supposed to cover most or all of your family deductible before your insurance kicks in. It's not supposed to cover your total medical expenses. And if you don't use it, you can roll it over. That said, I'd love to have the number doubled or even tripled. I'd also take a much higher deductible as well. If it were me writing the laws, I think a more-fair approach would be for HSA contribution limits to match whatever your plan's in-network out-of-pocket-maximum number is.... And no more requirement for the plan to be high-deductible. 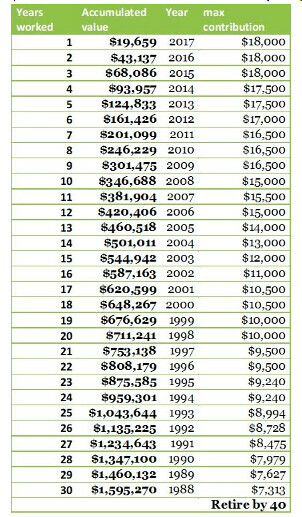 401k up to $19k and Roth up to $6k for 2019. Finally! About time. With inflation now in pretty much full swing, not a surprise. There goes next year raise. ugh! Finally. As predicted increases. Thanks for posting. On a somewhat related note, does anyone know when the 2019 tax year information will be released (brackets, standard deduction amount etc.)? I don't want to start a new thread just for this question. Here's the 2018 draft 1040 from September 2018. All tax tables should be included. Time in market beats timing the market. Woo hoo! First the iBond Fixed rate goes up, and now this. I merged bo105954027's thread into the on-going discussion. I merged GetMeToRetirement's thread into here. The software sorts by time, GetMeToRetirement was first. The Internal Revenue Service on Thursday unveiled the cost-of-living adjustments for pension plans and other retirement items for the 2019 tax year, including the first increase to the contribution limit for the Individual Retirement Arrangement in six years. The limit on annual contributions to an IRA has increased to $6,000 from $5,500 for the 2019 tax year, while the limit for employees who participate in 401(k), 403(b), most 457 plans, and the federal government's Thrift Savings Plan is increased from $18,500 to $19,000. ^^^ I merged JeepDaze's post into the on-going discussion. The combined thread is in the Investing - Theory, News & General forum (news). Thank you LadyGeek. I didn't see the existing thread, my fault. And only a Boglehead gets excited about turning 50 because he has another $6000 he can put in! Only 11 more years until I can put more into my 403B and 457B plans. Woohoo! I'm so jealous, I won't turn 50 for another 15 years. At least I get an extra $500 next year over this year! ^^^ Look at it this way. Your $500 over 15 years will be worth far more than someone who is near retirement and can only invest it for a few years. And I finally thought I was going to max my 457b next year. 2019 Employee Contribution: $19,000 ($25,000 for age 50 and above as the catch up contribution of $6,000 remains the same). From $5,500 to $6,000 ($7,000 for age 50 and above as the catch up contribution of $1,000 remains the same). How many are planning on taking advantage of the increases in 2019? I know that we plan to try and utilize as much of the contribution limits as we can due to being in our catch up years - empty nest years while keeping our expenses in check for our annual budget. My plan receives the company match, so we will max it out for sure. My wife's plan(s) are voluntary (403b/457b) due to being covered by a pension - so receive no company match, but we still try to fill at least one of them. I'll be taking advantage. My wife currently is at home with the kids so we have less retirement account "space" available, so this is increase is very welcome! The Mega-Back Door After-Tax limit is also up to $56,000 (from 55k). This is a total cap including the $19,000 employee contribution and any employer contributions, but not including the 50+ catch-up contributions. So if you have After Tax in your plan, you may be able to put in $37,000 (if your employer does not contribute), which is an overall $500 increase from 2018. Wow we need the 1982 max back. Assume the growth of the 401k is based on all dollars going into a s&p500 fund? It’s a good way to see how Our individual performance compares to the optimal choice in hindsight. Thanks for linking these charts! I am going to take advantage of it - but it will be difficult to max out the catch up contribution when I turn 50 in a couple of years. My employer offers a 10% discount on their stock - and I will want to max that out as well (at $25,000 a year) - so I'll be living with very little cash soon. Thanks for this info! Are the income thresholds the same as now for IRAs? I am going to take advantage of it - but it will be difficult to max out the catch up contribution when I turn 50 in a couple of years. Yes, salary becomes the limiting factor for most of us when it comes to household cashflow and being able to max out any or all plans. We were never able to max out everything before turning 50 due to raising children and all of the associated expenses vs. our actual gross income. Income growth in the past few years and the empty nest has allowed us to attack a bit better in the catch up years. Hopefully we can keep that up for a few more years. Especially if we can have the 1981 match! I knew these we're introduced for executives, but those amounts must have higher than the average salary back then! But have you looked at the tax brackets from 1980? I'm in the same boat as a single parent (divorced). The maximum contribution is nearly 1/4 of my gross income. I can't max out my 401k. I increase it every year as I get pay raises, but unless my mortgage suddenly disappears, I can't pull it off. Even after I am 50 I will still have a teenager living in my house. I do put $11k in my 401k and max out my IRA, that's the most I can do and still have money to pay the bills too. I will increase my IRA contribution to max it out though (I like it better since I have control where as the 401k is a very limited choice of funds I really don't like). I can pull off $42 more a month. I get a raise every January so there will be more money to save. I will also increase my 401k because I always put half of my raise into it. Our plan is to achieve max contributions for my 401k, and both my Roth IRA and my spouses Roth IRA. My spouse is not currently eligible for a 401k so if she becomes eligible in 2019 we will at least hit up to any match for which she is eligible, but highly unlikely to be able to max out for her. I merged CyclingDuo's thread into the on-going discussion. The combined thread is in the Investing - Theory, News & General forum.